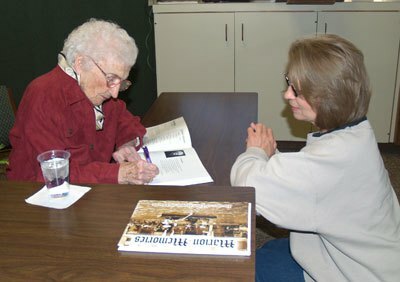 Micki Siebert (right), a native of Marion now living in Cedar Point, watches as Norma Hannaford signs a copy of the new pictorial book of historic photos called ?Marion Memories: Images of Our People & Places.? The signing occurred during the release party for the book at Marion National Bank on Thursday afternoon, Nov. 15. Hannaford, Marion?s oldest resident at a spry 103 years old, wrote the foreward to the book, which was produced by Kansas Publishing Ventures/Hillsboro Free Press.